I purchased this dress for my wedding in September 2018. I ordered a size 10 according to my measurements, however my dress was altered to be smaller once I received it (closer to a size 8). The dress is still regarded as a regular size 10 and cost a few hundred dollars to have altered by a professional seamstress. I had the sides taken in on both sides from waist down to hips, the straps shortened as they were hanging off my shoulders, and the dress shortened around the front as it was too long (I then wore high heels). I have size C bust but did not need to add any extra padding to the top to fill it in at all. My height is about 5'5 (again I wore high heels). I have since had it professionally dry cleaned and it's in amazing condition, like new! I can email more photos if need be. You are also welcome to try it on if you live nearby. Description from the website: "She is deliciously sensual and remarkably beautiful. She captivates the senses with her plunging low back, so delicately edged with the sweetest of lace and buttoning at the small of the back. Her lacy sweetheart neckline and thin straps – gasp – where she moves, everybody goes. 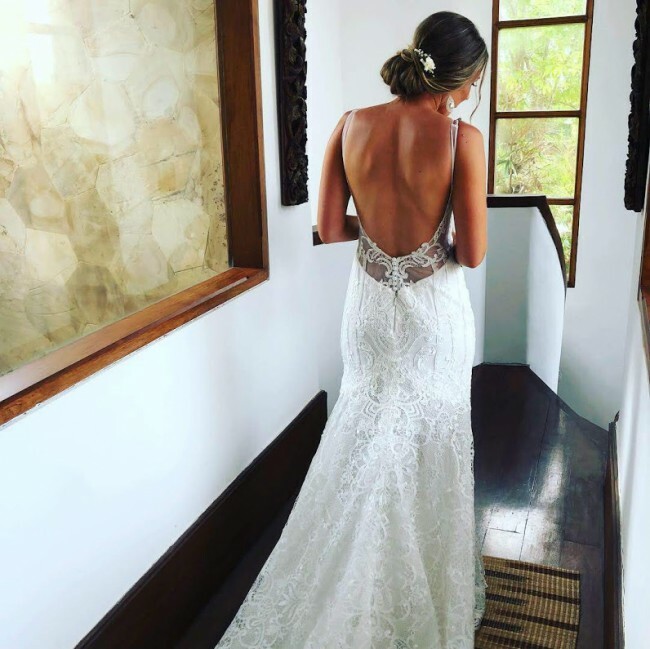 This dress is for the one bride who is brave and strong, and willing to let her curves shine; she is fearless and does not shy away from the limelight. Only those who dare to reveal the truth and beauty of being a woman will choose this divine gown. She will weaken even the strongest of men with her smouldering bodice and hip hugging ways that suits small and voluptuous figures". Used and dry cleaned. Altered by a professional seamstress. This is an absolute bargain for a MWL dress worn only once and in such good condition! I had the sides taken in on both sides from waist down to hips, the straps shortened as they were hanging off my shoulders, and the dress shortened around the front as it was too long (I then wore high heels). I have size C bust but did not need to add any extra padding to the top to fill it in at all. My height is about 5'5 (again I wore high heels).